Monster Energy Rock Allegiance returns to Talen Energy Stadium (formerly PPL Park) in Chester, PA, just outside Philadelphia, on September 17 & 18, 2016 with a lineup of over 35 bands on three stages, led by Avenged Sevenfold and Alice In Chains, along with Slayer, The Offspring, Breaking Benjamin, Volbeat and more. Monster Energy Rock Allegiance expands to two days in 2016, after the festival's single-day debut in 2015 shattered Talen Energy Stadium's previous attendance high by nearly 10,000 people, with over 26,000 total in attendance. 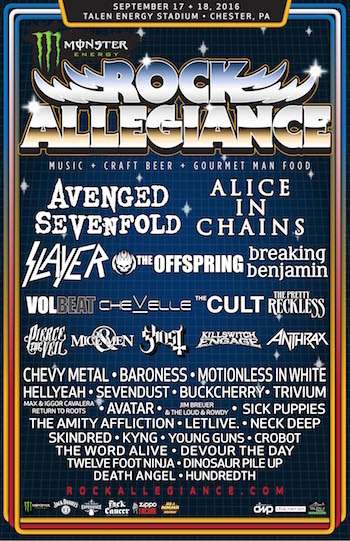 The initial Gourmet Man Food lineup for Monster Energy Rock Allegiance includes: Braz-B-Q, Chickie & Pete's, The Cow & The Curd, Dos Hermanos, Dump 'n' Roll, M.A.T.T. 's Gourmet Sliders, Mama's Meatballs, Seoulfull Philly, Sum Pig and The Tot Cart. Monster Energy Rock Allegiance producer Danny Wimmer of Danny Wimmer Presents says, "When we came to Philadelphia last year, we knew there was a demand for this kind of festival in the market, but the response exceeded our expectations. Growing to two days in our second year was an obvious decision, and we're looking forward to giving fans an even better experience in 2016." 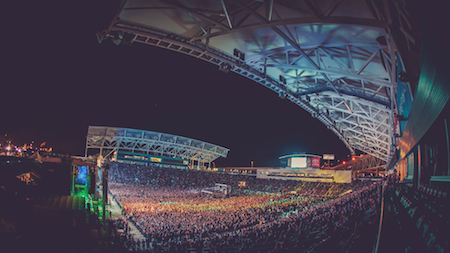 "Last year's Monster Energy Rock Allegiance was a huge success on so many levels," adds Geoff Gordon, Live Nation Philadelphia Regional President. "We were proud to bring this venue their first ever concert; a record-setting, sold out smash hit. The audience had such a great time enjoying a unique experience of music and lifestyle — we knew in 2016 we could turn it up a notch!" The festival is fueled by Monster Energy. Additional sponsors include Jack Daniel's, Zippo Encore, The Music Experience, Take Me Home, and Fxck Cancer/Dyin2Live, with more to be announced.